Explosive Eruption Risk and Decision Support for EU Populations Threatened by Volcanoes (EXPLORIS). In the last few decades the population worldwide has become concentrated in large conurbations at high risk from volcanic disasters. The most serious hazards are represented by the occurrence of pyroclastic flows and tephra fallout at European cities on explosive volcanoes and volcanic islands. Whatever the policy to mitigate such a huge risk might be, quantification of risk in association with a range of eruption scenarios, their impact, and mitigation are the fundamental priorities. This project addresses these critical issues by advancing critical scientific and technological facilities (e.g. simulation codes, vulnerability databases, and risk protocols) needed in volcanic risk assessment and mitigation. 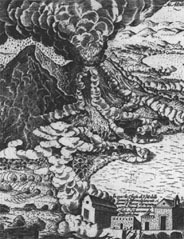 The project also aims to apply the facilities to those European volcanoes at high risk (Vesuvius, Italy; Soufriere, France; Sete Cidades, Portugal; Teide, Spain) so that they become a technology platform for exploitation at volcanoes throughout the world capable of supporting officials in deciding development and planning priorities as well as decision making in volcanic crises. The main objective of the project consists in the quantitative analysis of explosive eruption risk in densely populated EU regions and the evaluation of the likely effectiveness of possible mitigation measures (such as land-use planning, engineering interventions in buildings, emergency planning and community preparedness) through the development of volcanic risk facilities - such as supercomputer simulation models, vulnerability databases, and probabilistic risk assessment protocols - and their application to high-risk European volcanoes. The specific objectives we plan to achieve are: 1) Define quantitative volcanological scenarios for the most dangerous European volcanoes, 2) Develop massively parallel supercomputer models for the simulation of pyroclastic flow and fallout dispersal in 3D, 3) Develop vulnerability databases for buildings, infrastructures, and inhabitants, 4) Quantify the potential impact of the eruptive events, 5) Define potential mitigation measures, 6) Develop and apply probabilistic risk assessment protocols, and 7) Transfer the project findings to civil protection authorities in order to provide policy-relevant information. The approach adopted aims at gathering and combining knowledge deriving from different fields in order to provide a strategic multidisciplinary set of expertises. Competence in field volcanology, geology, physical modelling, applied mathematics, fluid-dynamics, computer science, engineering, architecture, medicine, and risk analysis are all involved in the project, representing a unique opportunity to improve European capabilities to undertake the complex task of volcanic risk management. 3D simulation codes, vulnerability databases, and probabilistic risk assessment protocols are concrete volcanic risk facilities, delivered by the project, that can be easily applied to other volcanic regions. Therefore, a possible exploitation of project results will consist in the application of the facilities developed to other high-risk volcanoes worldwide. The project also contributes directly to improve the quality of life of millions of people in high-risk European regions through the establishing of safer life conditions. In particular, the assessment of volcanic risk on a probabilistic basis, as well as the identification of possible mitigation measures, will certainly help in the definition of a mitigation policy aimed at the reduction of risk for cities on volcanoes and volcanic islands.